Leaves look like typical water lily, but flowers are yellow cup-like. Root used for stomach problems, heart, inflammation, spasms, constricts blood vessels. Do not take too much. Occasional seeds of Nuphar advena are attributed to individual plants growing within the mat in wet areas, a common occurrence in modern peatlands in Indiana. This is indicated by relatively abundant seeds of Brasenia schreberi and Nuphar advena. Three species distinguished the marsh phase from the previously limnic and subsequent fen phases: Brasenia schreberi, Nuphar advena and Nymphaea tuberosa. foliosus, Myriophyllum verticillatum, and Nuphar advena, occurred at [greater than or equal to] 50% of the survey areas; the latter taxon occurring at >75% of the areas. Group C Value Fidelity IN CR Taxon IN CR IN CR A A Chara braunii N N N N A A Chara globularis N N N N A A Chara foliolosa N N N N A A Myriophyllum spicatum N N N N A A Nitella flexilis N N N N A A Riccia fluitans N N N N A A Ricciocarpus natans N N N N A C Ceratophyllum demersum 1 5 EL M A A Typha latifolia 1 1 EL EL B C Elodea canadensis 3 5 L M B D Junuos effusus 3 7 L H B C Lemna minor 3 5 L M B C Lycopus americanus 3 5 L M B D Persicaria hydropiperoides 3 7 L H B C Sagittaria latifolia 3 4 L M B C Stuckenia pectinata 3 5 L M C E Brasenia schreberi 4 10 M EH C C Carex comosa 6 5 M M C C Cephalanthus occidentalis 5 5 M M C D Heteranthera dubia 4 8 M H C D Lemna trisulca 6 7 M H C C Najas flexilis 5 6 M M C D Nuphar advena 6 7 M H C D Nymphaea odorata subsp. Often associated with Brasenia schreberi, Ceratophyllum demersum Lemna minor, Najas flexilis, Nuphar advena, and Pontedaria cordata. Habitat: Quiet ponds and lakes, usually in soft, acid waters (Voss 1972); commonly associated with Elodea canadensis, Lemna minor, Myriophyllum exalbescens, Nuphar advena, Nymphaea odorata, Polygonom amphibium, Pontedaria cordata, Potamogeton pectinatus, Spirodela polyrhiza, and Utricularia vulgaris (Swink & Wilhelm 1994). 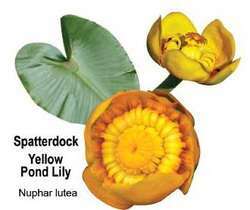 92, 1 Mitchella repens -- -- -- Nuphar advena -- P 4, 0. Nymphaea odorata, Nuphar advena and Brasenia schreberi, because of the shallow depth, probably grew across the entire water body.